Abstract. The impact of changes in incoming solar irradiance on stratospheric ozone abundances should be included in climate simulations to aid in capturing the atmospheric response to solar cycle variability. This study presents the first systematic comparison of the representation of the 11-year solar cycle ozone response (SOR) in chemistry–climate models (CCMs) and in pre-calculated ozone databases specified in climate models that do not include chemistry, with a special focus on comparing the recommended protocols for the Coupled Model Intercomparison Project Phase 5 and Phase 6 (CMIP5 and CMIP6). We analyse the SOR in eight CCMs from the Chemistry–Climate Model Initiative (CCMI-1) and compare these with results from three ozone databases for climate models: the Bodeker Scientific ozone database, the SPARC/Atmospheric Chemistry and Climate (AC&C) ozone database for CMIP5 and the SPARC/CCMI ozone database for CMIP6. The peak amplitude of the annual mean SOR in the tropical upper stratosphere (1–5 hPa) decreases by more than a factor of 2, from around 5 to 2 %, between the CMIP5 and CMIP6 ozone databases. This substantial decrease can be traced to the CMIP5 ozone database being constructed from a regression model fit to satellite and ozonesonde measurements, while the CMIP6 database is constructed from CCM simulations. The SOR in the CMIP6 ozone database therefore implicitly resembles the SOR in the CCMI-1 models. The structure in latitude of the SOR in the CMIP6 ozone database and CCMI-1 models is considerably smoother than in the CMIP5 database, which shows unrealistic sharp gradients in the SOR across the middle latitudes owing to the paucity of long-term ozone measurements in polar regions. 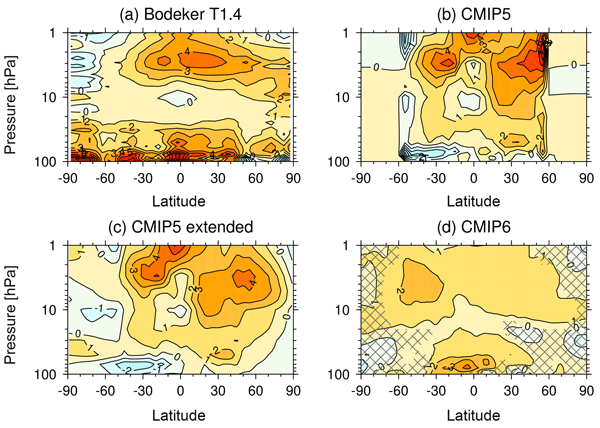 The SORs in the CMIP6 ozone database and the CCMI-1 models show a seasonal dependence with enhanced meridional gradients at mid- to high latitudes in the winter hemisphere. The CMIP5 ozone database does not account for seasonal variations in the SOR, which is unrealistic. Sensitivity experiments with a global atmospheric model without chemistry (ECHAM6.3) are performed to assess the atmospheric impacts of changes in the representation of the SOR and solar spectral irradiance (SSI) forcing between CMIP5 and CMIP6. The larger amplitude of the SOR in the CMIP5 ozone database compared to CMIP6 causes a likely overestimation of the modelled tropical stratospheric temperature response between 11-year solar cycle minimum and maximum by up to 0.55 K, or around 80 % of the total amplitude. 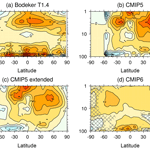 This effect is substantially larger than the change in temperature response due to differences in SSI forcing between CMIP5 and CMIP6. The results emphasize the importance of adequately representing the SOR in global models to capture the impact of the 11-year solar cycle on the atmosphere. Since a number of limitations in the representation of the SOR in the CMIP5 ozone database have been identified, we recommend that CMIP6 models without chemistry use the CMIP6 ozone database and the CMIP6 SSI dataset to better capture the climate impacts of solar variability. The SOR coefficients from the CMIP6 ozone database are published with this paper. How to cite: Maycock, A. C., Matthes, K., Tegtmeier, S., Schmidt, H., Thiéblemont, R., Hood, L., Akiyoshi, H., Bekki, S., Deushi, M., Jöckel, P., Kirner, O., Kunze, M., Marchand, M., Marsh, D. R., Michou, M., Plummer, D., Revell, L. E., Rozanov, E., Stenke, A., Yamashita, Y., and Yoshida, K.: The representation of solar cycle signals in stratospheric ozone – Part 2: Analysis of global models, Atmos. Chem. Phys., 18, 11323-11343, https://doi.org/10.5194/acp-18-11323-2018, 2018. The 11-year solar cycle is an important driver of climate variability. Changes in incoming solar ultraviolet radiation affect atmospheric ozone, which in turn influences atmospheric temperatures. Constraining the impact of the solar cycle on ozone is therefore important for understanding climate variability. This study examines the representation of the solar influence on ozone in numerical models used to simulate past and future climate. We highlight important differences among model datasets.